"...she's breaking up! She's breaking up!.... (crash) Col. Steve Austin, a man barely alive. Gentleman we can rebuild him, we have the technology. We can make better than he was before. Better... Stronger...Faster..." These words were first heard on January 18th 1974, as ABC broadcast the very first episode of the "Six Million Dollar Man". It was an overnight success, as who could resist tuning into the Bionic adventures of Colonel Steve Austin working undercover for the Office of Scientific Intelligence (OSI). And then in 1975, in the true spirit of Capitalism a beautiful thing happened, the market had become strong enough to support a toy line! So General Mills (ya know Cheerios), with Universal Studios, licenced it's up and coming Toy subsidiary, Kenner, to create Lee Majors likeness into one of the coolest toys ever, The Six Million Dollar Man Action figure. This 13" all hard plastic goliath, with red underwear, was created with some of the neatest toy innovations ever. He had a "see-thru" Bionic eye that made everything look far away, and the creepy "realistic" skin that rolled up on his bionic arm to reveal clear "Bionic" circuits. And the Coup the gras - the button on the back that, when his head was turned to the right, allowed him lift up to 2 lbs with the mechanical bionic clicking sound. (The legs were nothing special they were actually the same for all figures except Bigfoot) He came with a red "NASA inspired" jogging outfit, socks and red sneakers. This thing had a collar that would make Elvis cringe, and was cut just as low (hey it was the 70's). He also came with a car motor to show off his fantastic strength. All packaged in a hideous bright pink box. But this was just the tip of the iceberg! Other characters from the show appeared in the following years. Oscar Goldman, in his plaid sports coat and brown loafers, not to mention his exploding briefcase, full of case files and tape recorder. Keeping with the popular episodes, Bigfoot, and Masketron (bionic cyborg villain) were later introduced. Bigfoot featured a panel that popped off his chest to reveal circuits, when Steve gut punched him. Masketron (my personal favorite) was an evil cyborg, complete with masks to disguise him as Steve, Oscar or the guy who played him on the show. With different arms, and a black outfit he was the perfect nemesis for Steve. 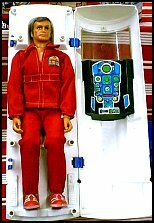 Kenner also produced 14 different outfits and "Bionic adventure packs", such as: the Bionic transporter, Mission to mars, Critical Mission arms and legs, and OSI undercover. Steve stayed pretty constant with only one real change. In 1977, Kenner changed his arm to have the "Bionic Grip", it looked the same, but was metallic under the real skin. It also had a button to replace the smaller circuit that made his hand close when you pushed it. The box got changed and he came with a steel beam instead of a motor. The line fizzled out as the show did, that's one of the problems with toys based on TV shows, in the late seventies. Bionic women toys were also produced, to go along with that other show. It was basically the same concept, Jaime and Oscar and an evil Fem-bot, were produced along with some other playsets, not as many as Steve. Because of the popularity of the TV show, Kenner made it's nitch, and even inspired other toy companies to rip them off, like Hasbro's Atomic man(1975). In like a lion out like a lamb, Six million Dollar man toys are still fairly easy to find in the box. The only thing that hasn't stood the test of time is the skin on the Bionic arm. These are some really neat toys, and inspired some super childhood adventures for boys and girls every where.